The two charts reproduced in this Blog are not comfortable viewing for Western pigmeat exporters. Certainly, if the patterns shown here are repeated over the summer then all bets are off for global pig prices in 2017. In the first chart I have added a line to represent the “normal” level of pigmeat imports in order to compare it with the actual level of pigmeat imports by China in recent years. That “normal” monthly level reflects an annual norm of around 1.4 million tonnes of imported pigmeat into the Chinese market. Watching how the actual levels of monthly imports move closer or further away from the norm gives us a clue as to whether the import demand shift that occurred from 2015 onwards in China is being maintained – or not. 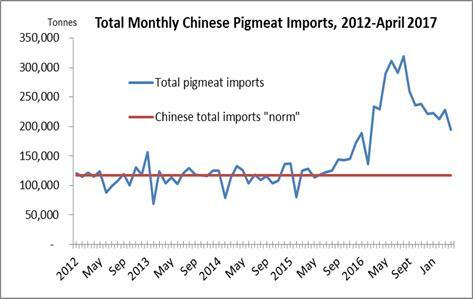 In these charts, it seems that China’s pigmeat imports are collapsing back towards their “norm”. There are obvious implications in this for exporters of pigmeat from the West. The second chart illustrates how the market shares of different (export) participants in China pigmeat market have changed. Canada has been a steady performer – with its volume of imports rising fairly steadily throughout the period shown (and over a longer period). The EU’s exporters – represented here by Denmark and Germany made significant gains in China in the longer period (2012-17). In the chart shown (restricted to the 2016-17 period) we see that Canada has held its level of sales almost constant. For the USA, Germany and Denmark, however, this period is one where shipments are falling fast. In the case of Denmark and Germany those shipments have recently fallen to their pre-2015 levels. In other words, back to the “normal” level of sales seen at that time. 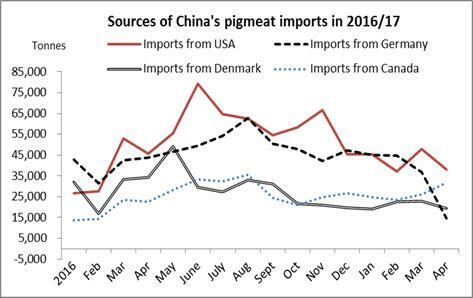 The level of US-sourced pigmeat supplies for China hasn’t fallen as far as this but the direction of travel is the same – downwards. These charts beg questions about how changes in import demand might be affected by other elements in the supply equation – like domestic hog numbers and pigmeat production. For a longer discussion of these issues see the latest issue of Whole Hog Brief (#269) and for updates on China’s trade in pigmeat keep reading Whole Hog Brief!